^ Emmerick, R. E. 1967. Tibetan Texts Concerning Khotan. Oxford University Press, London, p. 47. ^ Legge, James. Trans. and ed. 1886. A Record of Buddhistic Kingdoms: being an account by the Chinese monk Fâ-hsien of his travels in India and Ceylon (A.D. 399-414) in search of the Buddhist Books of Discipline. Reprint: Dover Publications, New York. 1965, pp. 16-20. ^ Hill, John E. July, 1988. "Notes on the Dating of Khotanese History." Indo-Iranian Journal, Vol. 31, No. 3, p. 185. Beal, Samuel. 1884. Si-Yu-Ki: Buddhist Records of the Western World, by Hiuen Tsiang. 2 vols. Trans. by Samuel Beal. London. Reprint: Delhi. Oriental Books Reprint Corporation. 1969. Beal, Samuel. 1911. The Life of Hiuen-Tsiang by the Shaman Hwui Li, with an Introduction containing an account of the Works of I-Tsing. Trans. by Samuel Beal. London. 1911. Reprint: Munshiram Manoharlal, New Delhi. 1973. Emmerick, R. E. 1967. 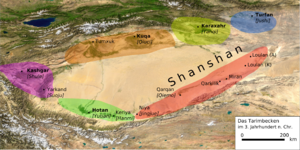 Tibetan Texts Concerning Khotan. Oxford University Press, London. Hill, John E. 2004. The Peoples of the West from the Weilüe 魏略 by Yu Huan 魚豢: A Third Century Chinese Account Composed between 239 and 265 CE. Draft annotated English translation. .
Legge, James. Trans. and ed. 1886. A Record of Buddhistic Kingdoms: being an account by the Chinese monk Fâ-hsien of his travels in India and Ceylon (A.D. 399-414) in search of the Buddhist Books of Discipline. Reprint: Dover Publications, New York. 1965. Watters, Thomas (1904-1905). On Yuan Chwang's Travels in India. London. Royal Asiatic Society. Reprint: 1973.